‘Every hour of every day, we’re smart in our own special way’ reads the penultimate page of this rhyming picture book for readers aged 4 to 7 years. The aim of the book is to show the reader ‘how smart you are the whole day through’ which is certainly good for young egos. Presented in mostly greens, oranges, blues and browns, the book shows children interacting with a host of beings, some other children and some monsters and some people like pirates, witches and clowns. 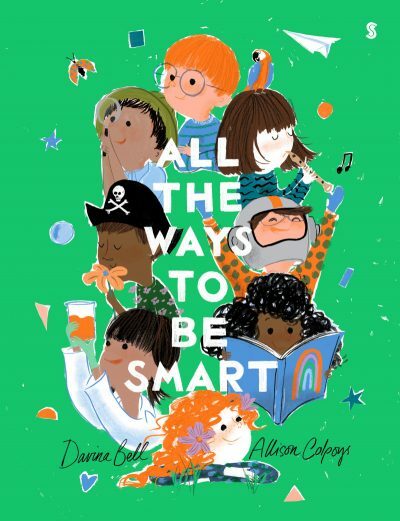 Numerous children, such as a red-haired boy, a brown girl, a boy wearing glasses and numerous others are shown being smart in numerous ways. These include being talented in arts and crafts: ‘Smart at drawing things with claws/facts about the dinosaurs’, and in treating other people humanely: ‘Smart is kindness when there’s crying’.